It is required to submit tests with your extension in order to pass validation. This walkthrough builds on the advanced sample extension which you can read about here Building an Advanced Sample Extension. If you are new to building extensions, we suggest that you get familiar with Building your first sample extension that uses new objects and extension objects. 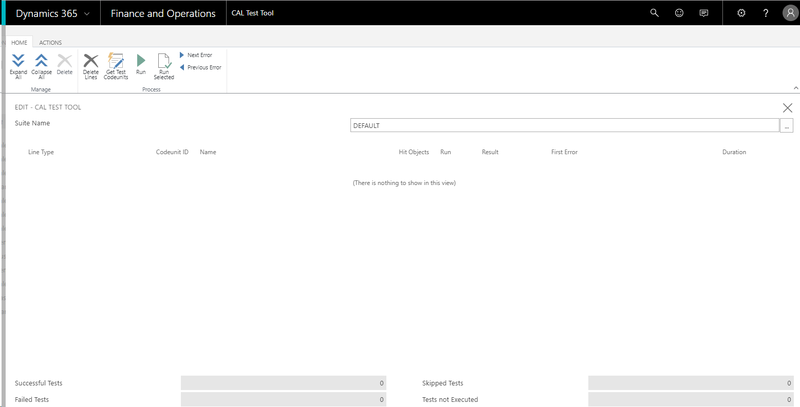 This walkthrough goes through how you develop the test for the sample Customer Rewards extension. For information about submitting your app to AppSource, see Checklist for Submitting Your App. Dynamics 365 Business Central Docker container-based development environment. For more information, see Get started with the Container Sandbox Development Environment and Running a Container-Based Development Environment. The AL Language extension for Visual Studio Code. Before writing tests for your extension, you need to identify all the areas of the extension that need to be tested. 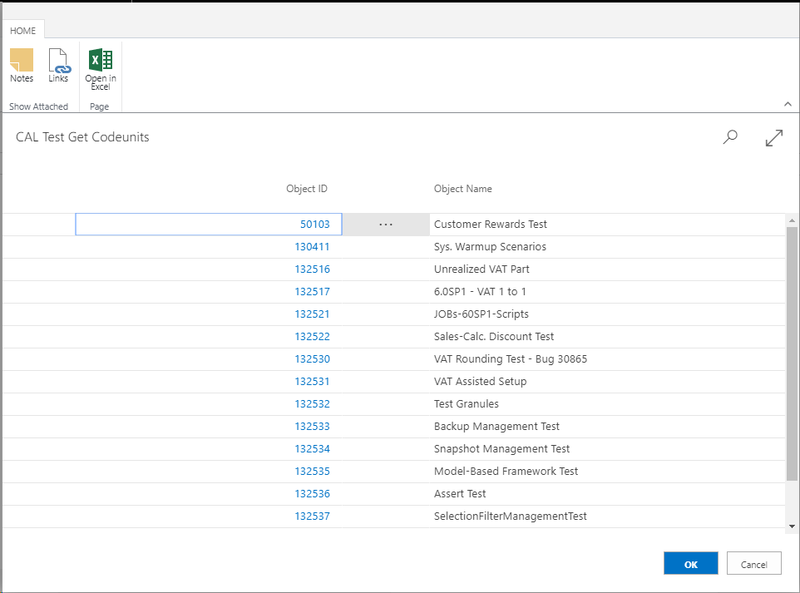 Ensure that your tests cover all the setup and usage scenario steps found in the user scenario document. This includes Assisted Setup, pages, fields, actions, events, and other controls and objects used by your extension. The CRONUS demo company will be used. If your app requires setup within the core product or any additional data, remember to include that in your tests. As part of your tests, remember to include tests that verify that the extension works as expected for a user that does not have SUPER permissions. Your tests should not make any requests to an external service. Mock your external calls to prevent this from happening. Logic in our Install codeunit. Assisted Setup - Customer Rewards Wizard page. We will verify that the wizard behaves as expected. It can be used to completion without errors. The Assisted Setup contains code that mimics making calls to an external service or API. Because our tests cannot make requests to an external service, we will mock the requests and the responses. Reward Level page. We will verify that the page behaves as expected when the user opens it whether Customer Rewards is activated or not. Customer List page. We will verify that our new Reward Levels action exists on the page and that it behaves as expected whether the extension is activated or not. Customer Card page. We will verify that the page has the Reward Level and Reward Points field that we added. New Customer should have zero reward points and corresponding reward level if defined. Different scenarios involving Customers and Sales Orders to verify that Reward Points work as expected and that reward levels for reward points work as defined by the user. Each test will also verify that the extension works for a user that does not have SUPER permissions. We will first create a new project (CustomerRewardsTest) for the tests. You are required to separate the extension and the tests into separate projects. Specify the dependencies between the extension (CustomerRewards) and the test (CustomerRewardsTest) projects. Our CustomerRewardsTest project will be referencing objects from the CustomerRewards project and so we will need to specify this in the dependencies setting in the CustomerRewardsTest project's app.json file. The dependencies setting takes a list of dependencies, where each dependency specifies the appId, name, publisher, and version of the base project/package that the current project/package will depend on. Another prerequisite is to update the app.json with a dependency to the test toolkit. For more information, see JSON Files. After setting the dependencies value, you will be prompted to download the symbols from the base project/package if they are not present. Codeunits with test functions to test various application areas. Codeunits with generic and application-specific functions to reduce duplication of test code. Application objects for running application tests such as the Test Tool page. Open the Nav Container Helper prompt found on the Desktop. You will see a list of functions that you can run on the container. Run the Import-TestToolkitToNavContainer function with -containerName parameter to import the test toolkit into the application database. Alternatively, if you use the New-NavContainer function from the NavContainerHelper PowerShell module to create your containers on Docker, you can add the -includeTestToolkit flag. This will install the Application Test Toolkit during the creation of your container. To help you design the relevant tests for your functionality, you can write scenarios that outline what you want to test, and you can write test criteria in the GIVEN-WHEN-THEN format. By adding comments based on feature, scenario, and GIVEN-WHEN-THEN, you add structure to your test code and make tests readable. The following sections provide an overview of the tags that we recommend you to use. FeatureTag represents the name of the feature, application area, functional area, or another aspect of the application. This list of tags must point to an area of your solution that is touched by the test. Order tags in descending importance. Start with the most important tags referring to the WHEN or THEN steps. The [FEATURE] tag can be set for the whole test codeunit. This means all tests in this codeunit will inherit the list of tags set there. If a test is supposed to have the same list of tags as the codeunit has, you do not have to add the [FEATURE] tag for this test. Add the tags only if the test has something specific to say. ScenarioID links the test to a work item for the functionality. For example, if you use Visual Studio Online or Team Foundation Server, [SCENARIO 12345] represents a work item with the ID 12345. TestDescription represents a short description of the purpose of the test, such as  Annie can apply a deferral template to a purchase order. The GIVEN-WHEN-THEN tags provide a framework for the specific test criteria. GIVEN Describes one step in setting up the test. If you feel a need to add an AND, you should probably add a separate GIVEN. In most of cases, in order to run an action under test, you must prepare the database. Tests can be complex, so you can add more than one GIVEN. They can come in one block or comment particular lines of code. Do not try to repeat code and comment each line. Instead, add information of a higher level that would be valuable when reading without the test code. WHEN Describes the action under test. A test is to test one thing. There should be only one WHEN in a test. It is the line of code that changes the state of something that we are going to verify. If you feel a need to add more than one WHEN followed by different verification, you should split this test in two or more tests. THEN Describes what is verified by the test. All tests must have a verification part. If there is no verification, the test does not test anything. You can add more than one THEN tag. We can now begin writing the tests for the extension. The 50102 MockCustomerRewardsExtMgt codeunit contains all the code that mocks the process of validating the activation code for Customer Rewards. Because we cannot make requests to external services in the tests, we define a subscriber method MockOnGetActivationCodeStatusFromServerSubscriber for handling the OnGetActivationCodeStatusFromServer event when it is raised in the Customer Rewards Ext. Mgt. codeunit. The EventSubscriberInstance property for this codeunit is set to Manual so that we can control when the subscriber function is called. We want the subscriber method to be called only during our tests. We also define a Setup procedure that modifies the Customer Rewards Ext. Mgt. Codeunit ID in the Customer Rewards Mgt. Setup table so that the actual OnGetActivationCodeStatusFromServerSubscriber will not handle OnGetActivationCodeStatusFromServer event when it is raised. // When set to Manual subscribers in this codeunit are bound to an event by calling the BINDSUBSCRIPTION method. // This enables you to control which event subscriber instances are called when an event is raised. // If the BINDSUBSCRIPTION method is not called, then nothing will happen when the published event is raised. A test codeunit must have its Subtype property set to Test and the test methods must be decorated with the [Test] attribute. When a test codeunit runs, it executes the OnRun trigger, and then executes each test method in the codeunit. By default, each test function runs in a separate database transaction, but you can use the TransactionModel attribute on test methods to control the transactional behavior. The outcome of a test method is either SUCCESS or FAILURE. If any error is raised by either the code that is being tested or the test code, then the outcome is FAILURE and the error is included in the results log file. Even if the outcome of one test method is FAILURE, the next test methods are still executed. Test pages mimic actual pages, but do not present any UI on a client computer. Test pages let you test the code on a page by using AL to simulate user interaction with the page. You can access the fields on a page and the properties of a page or a field by using the dot notation. You can open and close test pages, perform actions on the test page, and navigate around the test page by using AL methods. To create tests that can be automated, you must handle cases when user interaction is requested by code that is being tested. UI handlers run instead of the requested UI. UI handlers provide the same exit state as the UI. For example, a test method that has a ConfirmHandler handles CONFIRM method calls. If code that is being tested calls the CONFIRM method, then the ConfirmHandler method is called instead of the CONFIRM method. You write code in the ConfirmHandler method to verify that the expected question is displayed by the CONFIRM method and you write AL code to return the relevant reply. The following table describes the available UI handlers. procedure MessageHandler(Msg : Text); This handler is called when a message function is invoked in the code. The parameter type, Text, contains the text of the function. procedure ConfirmHandlerNo(Question: Text; var Reply: Boolean); This handler is called when a confirm function is invoked in the code. The parameter type, Text, contains the text of the function and the parameter Reply if the response to confirm is yes or no. procedure StrMenuHandler(Option: Text; var Choice: Integer; Instruction: Text); This handler is called when a StrMenu function is invoked in code. The parameter type, Text, contains the text of the function and Choice is the option chosen in the StrMenu. Options is the list of the different option values and Instruction is the leading text. procedure MappingPageHandler(var MappingPage: TestPage 1214); This handler is called when a non-modal page is invoked in the code. TestPage is the specific page in this case. procedure DevSelectedObjectPageHandler(var DevSelectedObjects: TestPage 89015); This handler is called when a modal page is invoked in the code. TestPage is the specific page in this case. procedure VendorListReportHandler(var VendorList: Report 301); This handler is called when a report is invoked in the code. Report is the specific report in this case. procedure SalesInvoiceReportRequestPageHandler(var SalesInvoice: TestRequestPage 206); This handler is called when a report is invoked in the code. TestRequestPage refers to the specific report ID. You must create a specific handler for each page that you want to handle. Any unhandled UI in the test methods of the test codeunit causes a failure of the test. When you test your extension, you should test that your code performs as expected under both successful and failing conditions. These are called positive and negative tests. To test how your extension performs under failing conditions, you can use the ASSERTERROR keyword. The ASSERTERROR keyword specifies that an error is expected at run time in the statement that follows the ASSERTERROR keyword. If a simple or compound statement that follows the ASSERTERROR keyword causes an error, then execution successfully continues to the next statement in the test function. If a statement that follows the ASSERTERROR keyword does not cause an error, then the ASSERTERROR statement itself fails with an error, and the test function that is running produces a FAILURE result. Initialize and set up the conditions for the test. Invoke the business logic that you want to test. Validate that the business logic performed as expected. Let us look some of the sample tests. This test verifies that the logic we defined in our Install codeunit works as expected. We first call a helper method Initialize which initializes and cleans up any objects that will be needed for the test. The Initialize method also binds our mock codeunit MockCustomerRewardsExtMgt to our test codeunit so that any events raised during our test can be handled by the subscriber methods specified in our mock codeunit. Next, we invoke the SetDefaultCustomerRewardsExtMgtCodeunit method, which is the method defined in our Install codeunit. And finally, we verify using the Assert codeunit from the Application Test Toolkit, that the Customer Rewards Mgt. Setup table contains the expected codeunit ID. This is one of the tests that focus on the Customer Rewards Assisted Setup Guide. The test verifies that an error message is displayed when a not valid activation code is entered in the wizard. First, Initialize is called to clean up previous state and bind our mock subscriber methods to the test codeunit. Additionally, we set our MockActivationResponse to return FAILURE since we are mocking a not valid validation of the activation code. We also use the Library - Lower Permissions codeunit to restrict the users permission to one that does not have the SUPER permission. Next, we open the Customer Rewards Wizard by using a Customer Rewards Wizard, the TestPage object is used to mimic the actual page. On the page, the activation code is entered and then the Activate action is invoked. And finally, we verify that an error message is displayed because the validation of the activation code failed. If no other error is reported then we are also able to conclude that the functionality in this test can be run without the need for a SUPER permission. This test verifies that the new Reward Levels action exists on the Customer List page. This is one of the tests that considers the interaction between Customers, Sales Orders, and Reward Levels. This test verifies that when two sales orders are made for a new customer, that customer accrues two reward points. Consequently, he attains the corresponding reward level for two points, which is the BRONZE reward level. First, the test is initialized by calling Initialize. The extension is activated and then a BRONZE reward level for two points or more is set up in the Reward Level table. Next, a new Customer is created using the LibrarySales codeunit from the Application Test Toolkit. And then, the LibrarySales codeunit is used again to create and post two sales orders for the previously created customer. Finally, to verify that the customer got the correct reward points and level, we open the Customer Card using its corresponding TestPage and then verify the values in the Reward Points and Reward Level fields. There are many more areas that we look at in the sample test. See the full codeunit below for the rest of the tests. codeunit 50103 "Customer Rewards Test"
// [Scenario] Error message when user tries to activate Customer Rewards without activation code. // [Scenario] Error message when user tries to activate Customer Rewards with short activation code. // [Scenario] Error message when user tries to activate Customer Rewards with long activation code. // [Scenario] Error message when user tries to activate Customer Rewards with invalid activation code. // [Scenario] Customer Rewards is activated when user enters valid activation code. At this point you can publish and run your tests on your tenant by pressing Ctrl+F5. In order to run the tests, follow the steps below. Open the Test Tool page (130401). Choose Get Test Codeunits and then choose Select Test Codeunits. Select your test codeunits and then choose the OK button. You can now see all the test methods from your test codeunits. 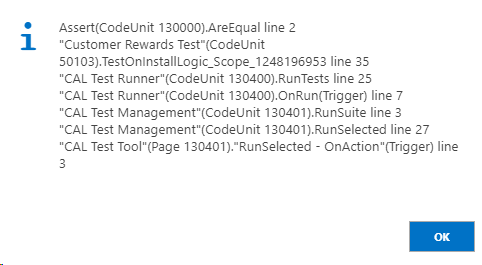 Now, choose Run or Run Selected to run all the tests in the test codeunit or only the selected tests. The Result column indicates whether a test was a SUCCESS or FAILURE. A summary is also presented at the bottom of the page. Now, anytime the SetDefaultCustomerRewardsExtMgtCodeunit method in the install codeunit is run, the Customer Rewards Ext. Mgt. Codeunit ID in the Customer Rewards Mgt. Setup table will be set to 0. Press Ctrl+F5 to publish the updated tests to your tenant and then run them. "Assert.AreEqual failed. Expected:<50101> (Integer). Actual:<0> (Integer). Codeunit does not match default." The error message shows that the actual result in one of our Assert statements differed from what was expected. According to the error message, the Assert statement was expecting a value of 50101 but actually got a value of 0. We can also tell where in our code this is happening because of the message; "Codeunit does not match default", which we defined earlier when we wrote our tests. If we had no idea where the error occurred, we can click on the error message to open the Test Results page and then choose the Call Stack action. Choosing the Call Stack action will give you a message alert that contains an ordered list of method calls up to the one that caused the error. The list of method calls is arranged from the most recent at the top to the oldest at the bottom. In our example, we can tell that the Assert(CodeUnit 130000).AreEqual (the first on the list) was the last method to be run, indicating where the error was found. Because we did not modify the Assert codeunit, then the wrong values or results must have been passed to it. The next item on the list, "Customer Rewards Test"(CodeUnit 50103).TestOnInstallLogic_Scope_1248196953 line 35 points to the method that was run before the final one that caused the error. This time, it is in the TestOnInstallLogic method of codeunit 50103 Customer Rewards Test after line 35. On line 36 of codeunit 50103 Customer Rewards Test, we can see the Assert statement that throws the error. We tested that the result should be Codeunit::"Customer Rewards Ext. Mgt." which is 50101, when our install logic is run, however, the result of the test indicated that we got a result of 0. This implies that our install logic is not working as expected. To fix this, we need to examine all the previous lines of code in the method to figure out where we went wrong. This will lead us to line 31, where the SetDefaultCustomerRewardsExtMgtCodeunit method call is made. When you go into the SetDefaultCustomerRewardsExtMgtCodeunit method, codeunit 50100 Customer Rewards Install Logic, you will see the change we made to cause the test to fail. Revert it so that CustomerRewardsExtMgtSetup. "Customer Rewards Ext. Mgt. Codeunit ID" now stores Codeunit::"Customer Rewards Ext. Mgt. ", instead of 0. Publish the updated extension and tests to your tenant and run the tests again. The test TestOnInstallLogic should pass now because the actual result matches what is expected. At this point, the Customer Rewards sample extension can be published and installed on your sandbox.